No matter what the workout of the day is, or wherever they train, Crossfit athletes share one common feature. They like to push their bodies as hard as they can every day. Like other athletes who participate in intense physical training or other physical activities, it’s not uncommon to wake up stiff or sore the morning after a hard workout. Soreness probably won’t stop a Crossfit athlete from training, but it may cause them to move less efficiently which can limit their ability to have a quality training session. While this soreness may not directly cause an injury, poor lifting mechanics due to impaired movement quality can lead to an overuse injury. So aside from a proper training program and appropriate “rest days” that are built into the program, what can a Crossfit athlete do to help prevent small issues become larger problems? One option available to Crossfit athletes is soft tissue mobilization. Soft tissue mobilization can improve tissue quality by improving blood flow, it can increase mobility and range of motion, and eliminate trigger points within the muscle which limit range of motion, decrease power and often times are a cause of muscle pain. 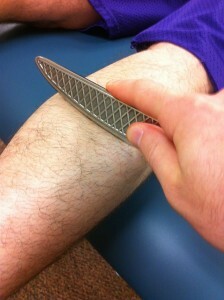 One of the most successful techniques physical therapists use to mobilize soft tissue is by using an instrument assisted soft tissue mobilization technique (IASTM). Does that only work if I’m already injured? Don’t wait till you have an injury that is limiting your function before you try something. Soft tissue work should be a part of your regular routine. Adding self-soft tissue mobilization techniques like foam rolling during your cool down before you stretch are a great way to help prevent injuries. However if you need a more precise technique to target a particular area of pain or soreness, IASTM may be something you want to consider trying. Periodic treatments (once or twice per month) can help target smaller trigger points or areas of restriction within the muscle that haven’t resolved with self-soft tissue mobilization.